lassù, lassù nei verdi pascoli. "Verdi pascoli" ends the album on a lighter note, although neither De Andrè nor Bubola were entirely pleased with the song. The song was inspired by Native American ritual dances that envisioned a time in the future when they would be liberated from their sequestration on reservations. up there, up there in the green pastures. at the bottom of the sky. at the bottom of the sea. 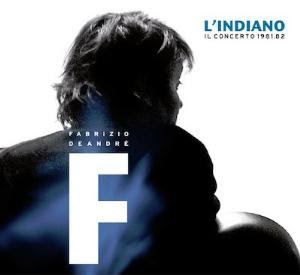 The album Fabrizio De André is better known as L'indiano based on the cover (a Frederic Remington painting "The Outlier") as well as on the contents of the album. 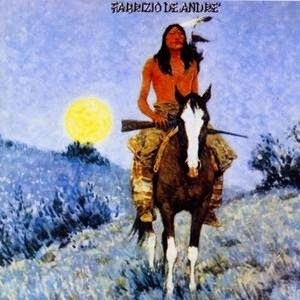 Released in 1981, the album grew out of deep reflections on the similarity between Sardinian culture and 19th century Native American culture. De André and his partner Dori Ghezzi had been kidnapped and held for almost four months in 1979 on the island of Sardinia, where De André lived much of the year. In his words, "an experience of this kind helps one rediscover fundamental values of life. You realize what it means to have warm feet, and what a great conquest it is to not have water dripping on your head while you sleep." De André and co-writer Massimo Bubola were familiar with the Native American story through books like Bury My Heart at Wounded Knee and movies like Little Big Man. De André's reflections on Sardinian and Cheyenne ways began as he sensed a similarity between the values of his captors (whom he refused to denounce at trial, stating they were the prisoners, not he) and those of Cheyenne warriors who risked death to steal horses from enemy tribes. He cited other similarities between the two peoples: economies based on subsistence not productivity, love and respect for nature, lack of interest in money beyond bare necessity, a great love for children, and both cultures being menaced by external forces invading traditional ways of life.